Now hows THAT for a bit of model variation out in fairyland!!! Starting to get interssted in Friday arvo through to Sunday. 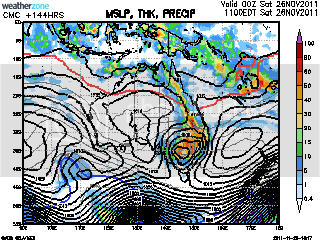 Maybe some arvo storms Friday and also Saturday with some high falls on the cards about the state. 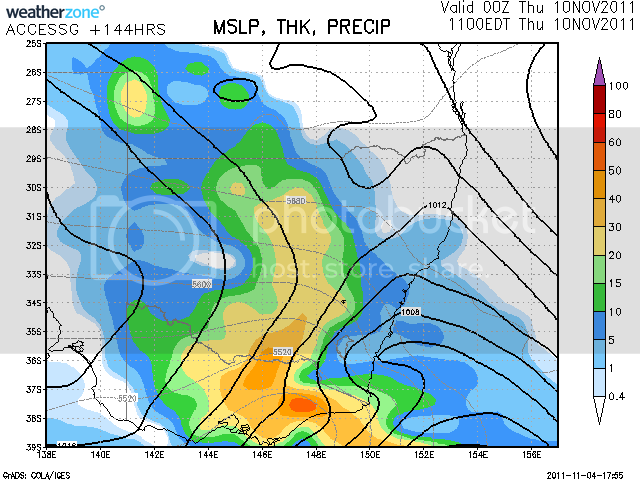 GFS looks very nice with some NW infeed, which nearly always results in storms and good rainfalls. 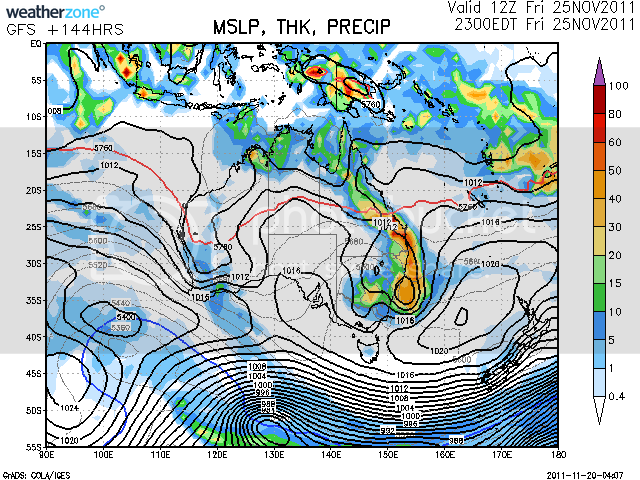 GFS has been swinging the last few days with high precip Albury area over the weekend. I am going to Coldchisel outdoor concert in Wodonga Fri 18th. Do you think chisel could sing me up a storm and then Barnsey be drowned out by thunder? EC has progged 23mm for N Gippsland next Wednesday, WZ hasnt posted updates for EC of AccG models yet so I cant comment on model consensus. 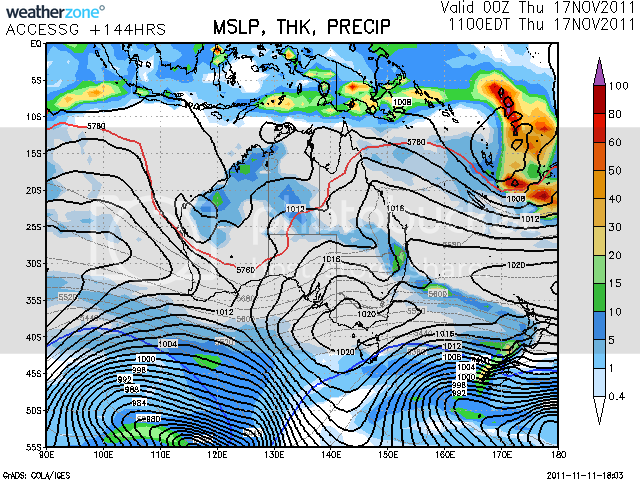 WZ has just updated GFS run, it wants nothing to do with mid week rain (thank God for the VIc farming harvesters). Whats going to happen after the next high clears to Vic E at the end of next week? 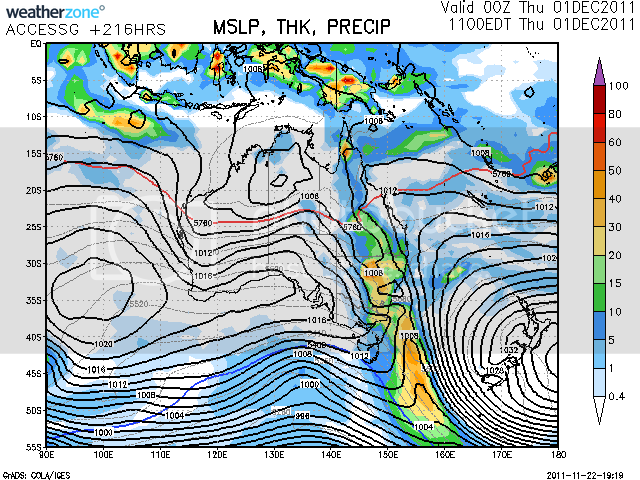 There is going to be plenty moisture available to Vic N again! If something can allow it to be drawn down we (here) will be swimming! 90+mm here this month so far. So this prog from GFS for next Friday night looks a bit omninous! Maybe time to start a thread eh (I always stuff up the dates!). I read elsewhere that maybe in a fortnights time roughly that we could be in for a very large scale rain event if things line up right. Of course it is a long time away and I am sure there will be some rain and storms in between. I DO ENJOY the build up to these systems and find it absolutely fascinating reading others opinions of how the system may pan out, it is much more interesting then listening to the weather on the tv or the radio. It's like a child looking at their presents under the christmas tree, the anticipation and the waite is what makes the unwrapping so much better. Heard that too TU, AV from AWF is mooting this as well and he is the guy that predicted the massive rain Vic got earlier this year. On a closer timeframe, CMC is also playing with the possibility of wetness in S NSW albiet into next Sat - a day later than GFC's musings posted above. Well time to start a thread on this possibility IMO. Will this cross the border or not Fri-Sat? Some models toying with the idea. Petros, where do you find those prediciton maps - I've only found the 14 day ones and they never seem to match? I get my models from weatherzone and pay for the Pro Silver Acces which I think $5.00 per month. 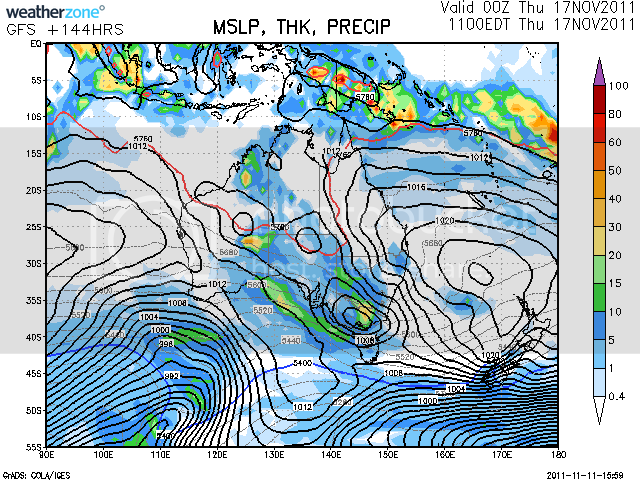 You can still see some models with out joining If you go click on radar & maps then click on australian charts (above weatherzone 14 day outlook) then click on BOM it will give you the access model runs or click on GFS will give you GFS model runs, then you can click on each day for a bigger view. If you are signed up with Pro you get many extras like being able to get a close up of a particular state it will also also give you access to the CMC, TWC models etc and there are quiet a few other things that you can access too by joining up with the Pro that are especially handy for storm followers. Yep I do exactly as TU said liberator. EC shows my area to get another 16mm mid next week. On top of what could possibly be serious rain for us in central Vic (we are wet here, and lake glenmaggie is full). We really dont need this potential followup system, and this is AccG not EC! 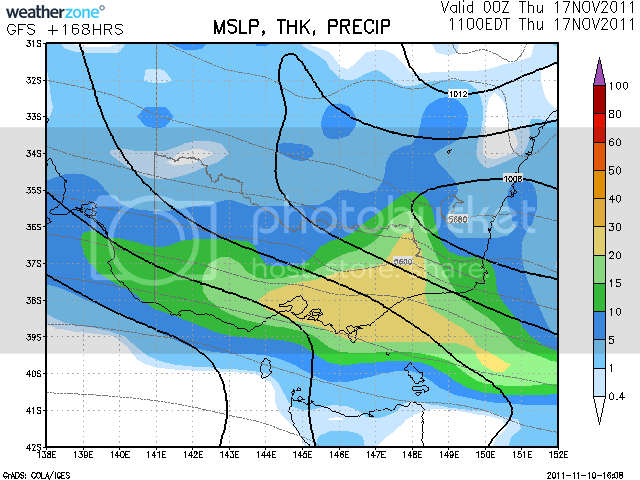 EC has just doubled the expected rain for Maffra next Wed from 16 to 33mm. Would someone PLEASE start a thread on this potential event? So after the cool spell as this week concludes and a pretty stable weekend compared to recent times, inland moisture looks to be building again in the new week. Some hints of another big system from the SW coming up to draw it all down for another thundery and or rainy episode as we get toward the end of the 1st week of December. 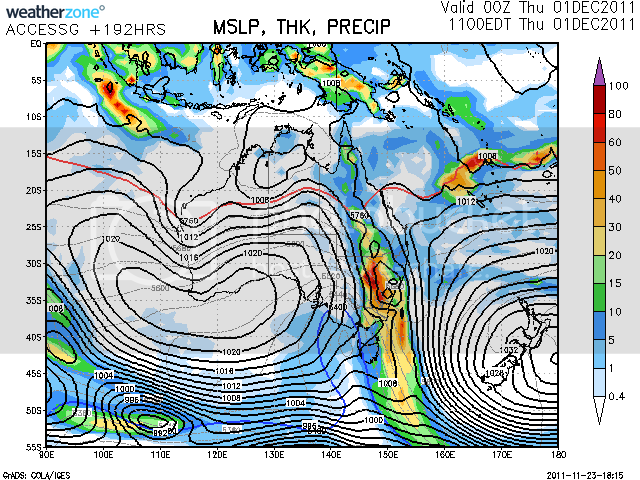 If this pattern keeps up once the wet begins up north, eastern Australia will be swimming. An comment on the possibility of a very warm/wet/humid northerly system Thu/Sat next week that looks to provide big storms for Vic (acc. to last run of AccG)? 6 registered (bundybear, red earth, Homer, explorer, Manly, Sidney), 64 Guests and 4 Spiders online.